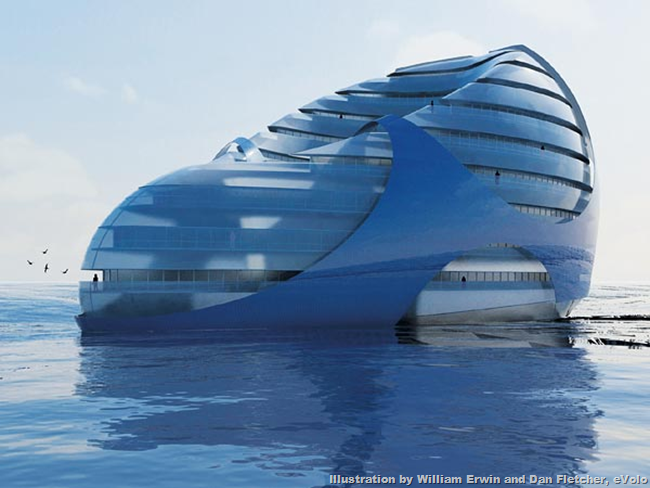 Touted as an eco-friendly floating city, the Seascraper (pictured in an artist's conception) is among a raft of concepts for sustainable offshore settlements. With more than seven billion people on the planet, mass migrations to cities, and increased risks of flooding and sea level rise, more and more architects and innovators seem to be weighing anchor. The Seascraper - a self-sufficient community of homes, offices, and recreational space - was designed with the intention of slowing urban sprawl, according to its designers. The vessel's energy independence would come from underwater turbines powered by deep-sea currents as well as from a photovoltaic skin that could collect solar energy. The concave hull would collect rainwater and allow daylight to reach lower levels. Fresh water would come from treated and recycled rainwater via an on-board desalination plant. This green machine would also help keep marine populations afloat, so to speak, with a buoyant base that serves as a reef and discharges fish food in the form of nutrients pumped from the deep sea, the U.S. design team says.